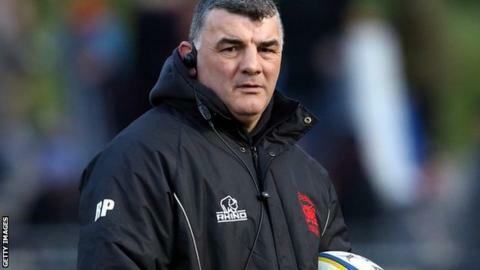 London Welsh head coach Rowland Phillips has signed a new deal with the club as he prepares to lead them in the Championship next season. The former league and union player was previously in charge at Italian sides Aironi Rugby and Viadana in the Pro 12. Phillips also coached Neath and was Wales' defence coach under Gareth Jenkins for the 2007 World Cup. "I'm excited about the challenge of guiding the club back to the Premiership and we have already begun planning for next season," Phillips said. "Against Leicester Tigers we fielded 11 players in our starting line up committed to the club for next season, with six more on the bench, and that bodes well for next season's Championship campaign.